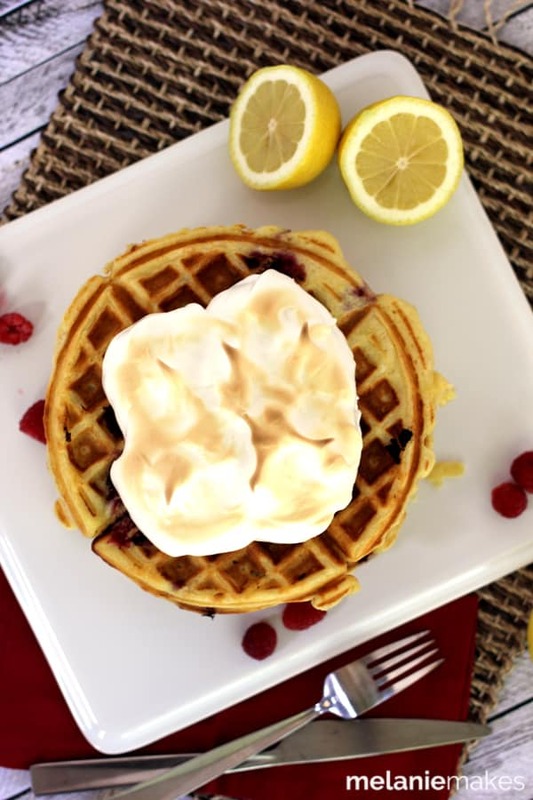 These fluffy, light as air Raspberry Lemon Meringue Waffles are flavored with lemon yogurt and lemon zest and then studded with fresh raspberries. They’re browned to perfection and then – oh, it’s the best part! – forget the syrup! These waffles are topped with the lightest of meringues. With Memorial Day last weekend acting as the signal to Summer, I’ve noticed I’m making a change in what I’m preparing in the kitchen. Gone are the heavy comfort foods. So long to using the oven as much. Sianara to dishes that take a long time to prepare. I’m all about lighter dishes that are packed with flavor, minimal on prep time and that won’t heat up the house either. We’re big waffle fans in our house. And I mean, BIG. As in when Andy’s parents are visiting and his sister is present for breakfast or brunch, I’m quadrupling my Yogurt Waffle recipe. As much as we love it, I wanted to put a bit of a Summer spin on it. 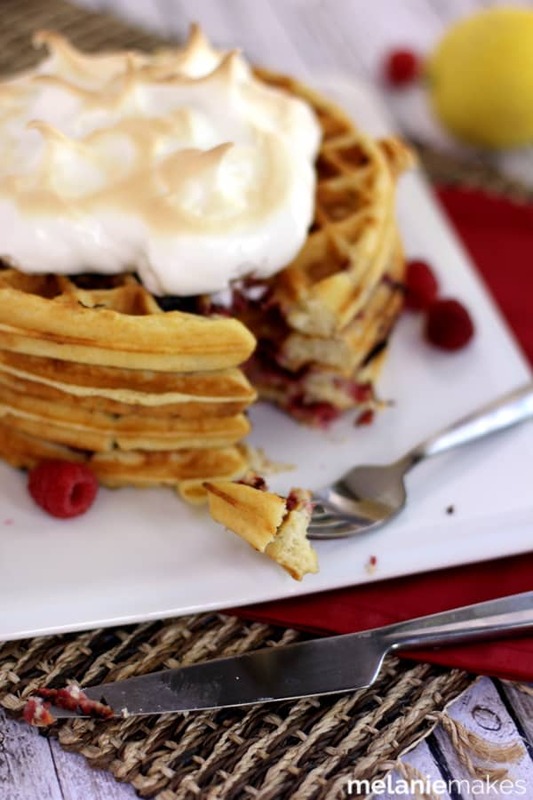 These Raspberry Lemon Meringue Waffles scream “Eat me outside on the patio!” Or at least, that’s what I imagine they’re saying. Perfect to enjoy in the morning hours or even as a late night dessert. Or if my four year old had her way, BOTH! 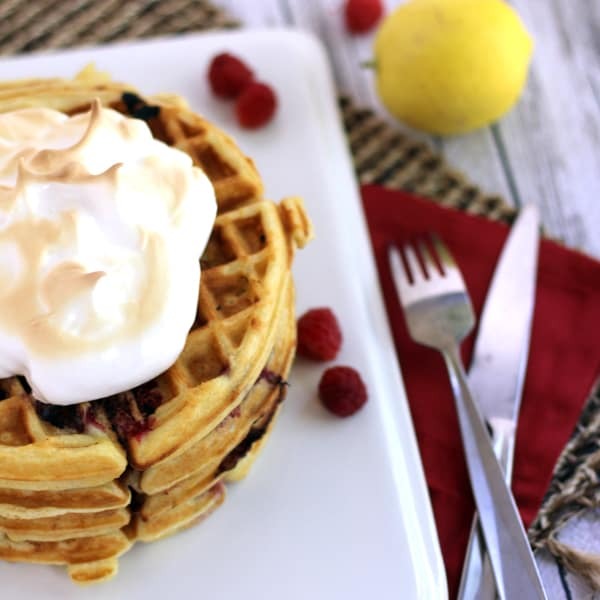 Fluffy, light as air Belgian waffles flavored with lemon yogurt and lemon zest and then studded with fresh raspberries are absolutely out of this world. And no oven required! They’re browned to perfection in your waffle maker and then – oh, it’s the best part! – forget the syrup! These waffles are topped with the lightest of meringues. See, I told you they’d be perfect for dessert! I love using Davidson’s Eggs in this recipe as they are pasteurized, eliminating the risk of harmful bateria and viruses. Simply put, I can prepare this dish containing eggs any way I’d like and don’t have to worry about anyone possibly becoming sick. Love that! In the bowl of an electric mixer, whisk eggs until frothy. Gradually add sugar and continue to beat until stiff peaks form. Whisk flours, sugar, baking powder and salt in a large bowl to combine. Make well in center and add melted butter, milk, yogurt, lemon zest and eggs. Whisk to combine, just until smooth. Gently fold in raspberries. Heat waffle iron and spray with non-stick spray. Ladle approximately 1/2 cup batter onto waffle iron and close. Cook until waffle is golden brown. Top waffle with meringue and brown, if desired, with handheld torch. Serve immediately. Want to find additional recipes featuring Davidson’s Eggs? Look no further than our Sunday Supper table! 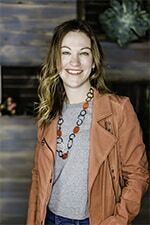 Connect with Davidson’s Eggs on their website, Facebook, Twitter and Pinterest. To find a store near you that carries Davidson’s Eggs, use their helpful store locator. This post is sponsored by the Davidson’s Safest Choice Eggs. All opinions are my own. 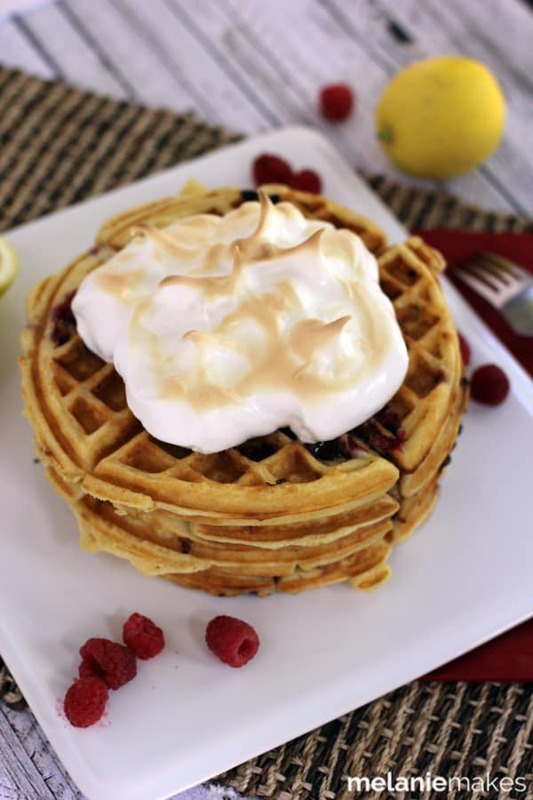 I would never have thought to put meringue on waffles! I love it! These would be perfect for a girls brunch! Pinned! Such a great girls brunch idea - let me know if you give them a try! I don't know if I want this for breakfast or dessert. Nah breakfast, definitely a really awesome breakfast! I'll have this for breakfast any day! Look at that beautiful meringue and those waffles! I get more and more impressed with your recipes each week, Melanie. Will you come and cook for me, please? I'm loving the raspberry and lemon combination. YUMMY!!! Perfectly fruity waffles! Love them! These waffles scream to be eaten ANYwhere!! What a fantastic idea for waffles!!! My g-kids would LOVE these too!!! Putting meringue on waffles is genius! I would definitely enjoy this for a late night snack. What a spectacular breakfast!!! Such a delicious way to start the day! Ohhh I like this it like lemon pie meets a waffle! I think your daughter is right…these waffles are perfect anytime! These waffles look absolutely epic! 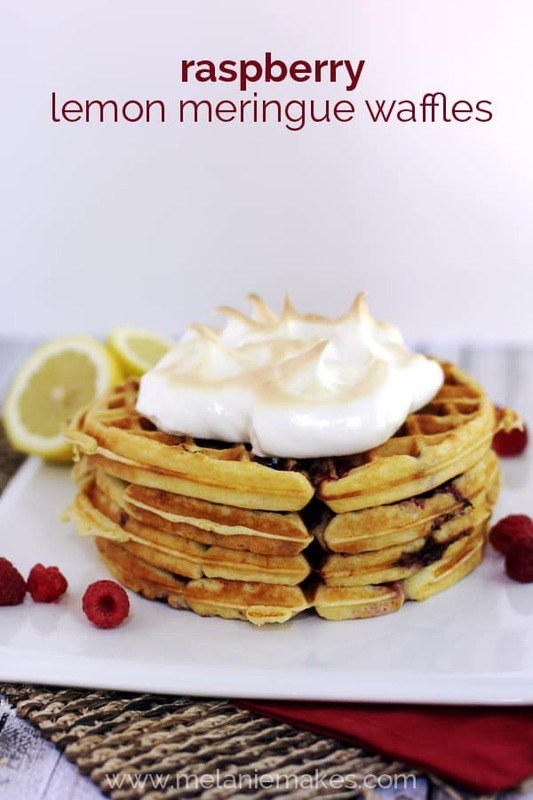 I have never tried a waffle with meringue on top, but this is definitely on my list now! I have never seen waffles look this good! What a great and unique recipe! 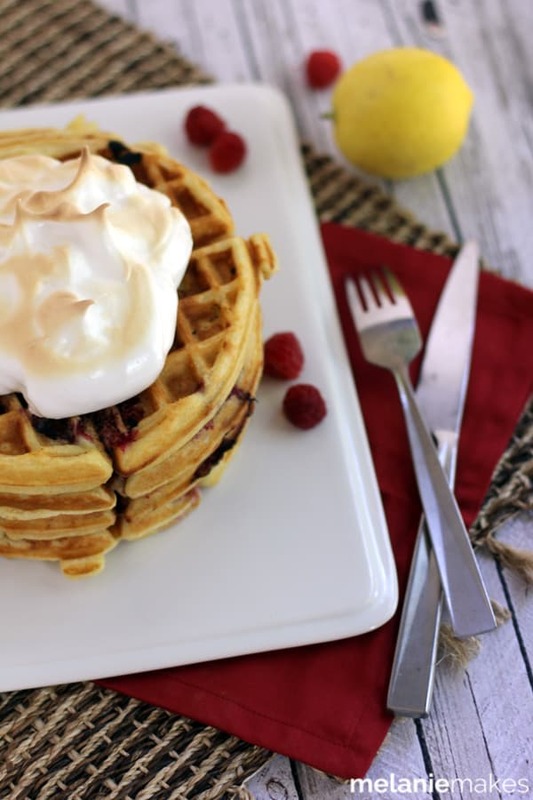 Wait, did you say I could have MERINGUE on my morning waffles? Epic! I'm craving waffles so bad right now thanks to you. And yes, these definitely scream to be eaten on the patio.